Here we are on Day 2. No, you didn’t miss a post from Day 1, there was just no time to write yesterday. The opening session with Frank Doran, Hiroshi Ikeda, and Christian Tissier Senseis made for a great evening. I feel so fortunate to get to train with these three shihan-level instructors right here in San Diego, and am grateful to Jiai Aikido for hosting the Aikido Bridge Friendship Seminar every year. This is the 6th year I’ve participated – every year since I started training. I managed to get home, get my chores and laundry done, and eat a bowl of cold clam chowder (I was really tired and lazy, plus I actually enjoy it cold – with a can of salmon dumped into it), and collapse into bed just in time to get 4 hours of sleep. Up at 5:30 this morning for the first full day of training – 6 hours on the mat. Same schedule for Saturday and Sunday, and then a 2-½ hour session on Monday morning. 22-½ hours of classes in all. Whee! Last year I went to very few seminars because I was busy with projects at home, and missed most of the Bridge seminar because I’d been sick, so it’s been both exciting and comfortably familiar to be training with everyone again. A few of the regulars couldn’t be here this year, and of course there are lots of new folks. A very good turnout, and Saturday should probably have even more people. But I do recognize that I’m catching on more quickly. I’m more able to drop my existing understanding of techniques to actually try to see and experience what the teacher in front of me is showing. I’m more patient with myself, too. In past years I’ve sort of wanted to come home with a basket of new bits of knowledge. Now just the process of learning is fun, and while I do hope to play with some things in coming weeks and months, I don’t feel so desperate to remember the details of every point I hear. The first session this morning was mostly suwari-waza – techniques done on our knees. I’m really glad I’d been practicing that lately. Still, my leg muscles are sore! The instructor of that class (I’ll have to get his name…) was so enthusiastic and fun. 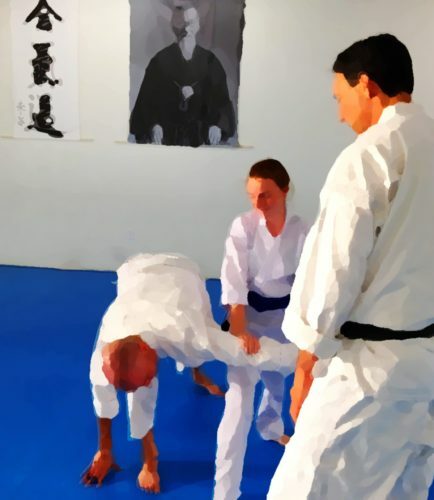 I’ve seen this from a lot of teachers, especially Ikeda Sensei, but this teacher especially embodied the enchantment and discovery that Aikido training offers. Sort of a twinkling-eyed “isn’t it cool that this stuff works” sense to him. Lots of details of a few techniques today, seen from different perspectives. A lot of it eludes me, but there are subtleties I can see from time to time. Francis Takahashi Sensei is at the seminar, and I’ve gotten to spend a bit of time talking with him, with is always a privilege and a pleasure. George Ledyard Sensei is here, and I got to train with him briefly during Ikeda Sensei’s class, which really helped me understand what was being demonstrated. I got to punch Wilko Vriesman Sensei as part of a demonstration. He made a grand show of staggering backward halfway across the mat. Lots of fun comments on that after class. I’d best get stuff ready for tomorrow, take a hot bath, and get to bed. As it is, 7 hours of sleep is the best I can do tonight.